Plant the Edifier Luna HD speakers in your home and you'll be treated to audio that sparkles, although while Edifier claims the Luna HDs are a fine companion for gaming consoles, most gamers will want either a surround sound system or headphones to really immerse them. Thanks to the design of the revised version of Edifier's crisp-sounding Luna speakers, the Luna HD stereo speakers could pass for modern art, just like the original set. The sound quality is exceptional for a stereo setup, which it ought to be for $249.99 / £179.99 / AU$299.95 (the same price as the superseded models). So while they sound great and look even better, we’re disappointed that the speakers don’t offer many inputs – there’s only Bluetooth 4.0, optical (the only addition over the previous model), and a standard 3.5mm jack, and the latter two share the same port. Nor is there any mention of Google Assistant and Amazon Alexa integration, so if you want a digital assistant at your beck and call you’ll have to look elsewhere, or hook them up to an Android device or Amazon Echo speaker. Edifier is promoting the Luna HD’s as being ripe for games consoles, thanks to the inclusion of the optical input. If you’re a little sceptical about having a stereo setup for your high-powered console and married to a 4K screen, you’re not alone – but they pack enough oomph and sonic performance to make you look twice. While simplicity is the philosophy here, don’t mistake that for boring. The Luna HDs are truly beautiful to look at, and will draw plenty of ‘oohs’ and ‘aahs’. An exposed three-quarter inch tweeter sits above a 3-inch bass driver on the front of each speaker, mounted on a slightly concave ‘slice’ that angles slightly upward. On the rear, a thick wedge has been carved out of the ovoid shell, giving two passive radiators a chance to flex back and forth under heavy duress. They are available in three different color options – white, black and red – with a bold, glossy finish. The right speaker is the master, while the left acts as a slave, connected by a 3m long proprietary six-pin cable. It will comfortably go around the back of a 70-inch TV. The power and the solo source input are hidden on the rear of the right speaker, which also has touch controls. The power on/off and volume controls live on the left-hand side of this right speaker, so you won’t accidentally brush them when walking past. It’s probably also there to minimize the amount of fingerprints the shell will inevitably collect. Our test unit needed constant polishing (mostly because we were moving them around a lot), but fortunately the two soft cases in the packaging come with a microfiber lining to help remove any blemishes. The optical input also acts as the port for a 3.5mm male-to-male line-in, and Edifier thoughtfully includes all the cables you’d need: the optical, the long 3.5mm cord and a stereo RCA cord too. Remember, there is just one input here, so you will need a separate control box to hook up multiple streaming devices as well as games consoles, or route them all through your TV. The touch controls are flush on the side of the casing, and you’ll need to look carefully to find them. Swiping motions take care of skipping or rewinding tracks, as well as muting the volume. This panel is responsive, but you might crave something a bit more tactile, but there is a light on the front of the right speaker to indicate changes in volume. While the remote control is as slender and simple as the speakers, it only has power and volume controls. You will need to have your device to hand to change tracks, or put your fingers all over the speaker itself. Edifier doesn’t do boring in design, and it certainly doesn’t do boring when the Luna HD speakers are purring or roaring. You don’t have to turn them up to get the most out of them either, although push them to their maximum volume and they'll comfortably hold their own with no clipping or loss of clarity. What they offer is a wonderful balanced sound. Edifier has built DSP (digital signal processing) and DRC (dynamic range compression) into the speakers, which keeps the sound tamed while still giving it room to spread wide. Our test incorporated a few MP3 albums encoded at 320kbps, a Spotify playlist and several games on Xbox One X. With the right amount of room between the speakers – preferably employing the full amount that 3m cable will allow – you’ll be able to appreciate the Luna’s confident sound stage. That’s to be expected, as the speakers use the same hardware as their predecessor. Tame Impala’s Let It Happen blossomed confidently from our setup, while the steely guitar twang in the opening bars of Arcade Fire’s The Suburbs were all present. All of the flourishes in the Avalanches’ Since I Left You came through loud and clear. It’s a similar story using Spotify, with equivalent tracks slightly detuned thanks to the compression, but still worth boasting about. However, Edifier is partly promoting these as gaming speakers, although a stereo setup doesn’t do games much justice. That said, Edifier is confident that its speakers don’t need any gimmicks like virtual surround sound to convince gamers to give them a go. The snap and crackle of exhausts in Forza Horizon 3, again, shows the Lunas have muscle and scope. Even the sounds of the prairie in Red Dead Redemption build atmosphere from two front-firing speakers, but if you’re coming to these from a surround sound setup you may miss the all encompassing feeling only rear boxes can provide. Simplicity belies spectacular performance. Sill, this is a minor refresh over the outgoing Edifier Luna speakers with only the optical input – primarily designed for TVs and games consoles – worth a bullet point on the back of the box. Unlike other speakers competing in the same space, there are no smarts integrated into the Luna HD – there’s no app to control the soundscape, no Google Assistant or Amazon Alexa integration, and nor will there be. All of that, however, doesn’t hide the fact that the relatively diminutive Luna HD speakers let the audio quality sell them without the need for all the bells and whistles. 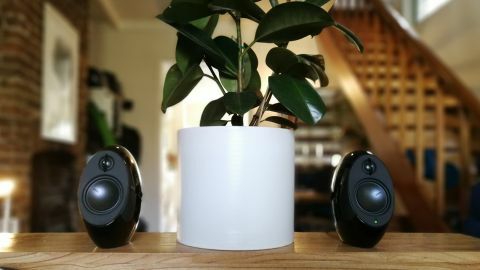 Plant them in your home and you will be treated to audio that sparkles, and can do without you fiddling with the equalizer setting. While Edifier claims the Luna HDs are a fine companion for gaming consoles, more gamers than not will want either a surround sound system or headphones to really immerse them. If, however, gaming is a ‘sometimes’ activity and you crave excellent sound without sacrificing space on your TV unit, you’ve found a superb option.